The din of clanking bottles and cans is music to Allen Parkers ears. He found his dream career  redemption  about six years ago. At 33, the Burlington resident is proud of his speed and accuracy in a frenetic operation that handles an estimated 26,000 empties on a busy day. Parker, a wiry man with brown hair and blue eyes, plies his trade in an enormous garage attached to a convenience store. 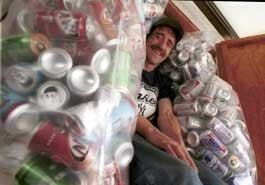 In business since 1978, the Burlington Beverage Center and Bottle Redemption on North Winooski Avenue is bustling on a typical Thursday afternoon as customers drop their returns into an enormous metal bin. To sort the plastic and metal containers from this collection point, Parker makes rapid-fire tosses into about 45 tall cardboard boxes labeled with specific product names  Pepsi, Coke, Budweiser, Catamount. He handles glass more gingerly; those items go into shopping carts that another employee wheels away for careful placement in the appropriate cartons. People who enjoy the sweet fizz of sodas or the spirit of spirits might not appreciate the effort that goes into recycling the detritus of their thirst-quenching habits. But what may seem like a dead-end job to some remains a creative opportunity for Parker, who just wants to make sure what goes around comes around. SEVEN DAYS: How did you get started in this profession? ALLEN PARKER: I had done restaurant work and other odd jobs. But I was a customer here and, one day, a huge order came in. I volunteered to help because I know what a bottles worth. A nickels a nickel these days. SD: What appealed to you about this line of work? AP: I always wanted to be a cook, and I did that from age 18 to 26. But I got sick of it. Too many bosses. Here, Im my own boss. And Im friendly with the owners, Robin and Jessica Hammond, so its like a family. I dont see myself quitting any time soon. I find it amusing. AP: I like watching peoples faces. The faster I count, the more amazed they look. Ive counted 100-some-odd dollars in my head at once without stopping. And theyre amazed how I shoot plastic bottles and cans into the boxes so fast without missing. I should charge admission. I could be a sideshow at the fair. SD: With such terrific aim, were you a basketball player in high school? AP: I was not good in sports, but I was great at math. SD: Doesnt counting bottles at that pace make your head spin? SD: Is there a downside? AP: It can be a real nasty job sometimes. Ive been cut a couple of times when I dont notice a broken bottle in the bin. And we wont take squished cans. We try to enforce the make-em-somewhat-respectable rule. SD: Does that mean rinsing things out before bringing them in? AP: Yeah. I personally enforce cleanliness. I try to emphasize to customers that the more organized your bottles, the quicker youre gonna be served. SD: Is the job ever just plain disgusting? AP: (Nodding) Once a customer came in carrying a bucket of cans and bottles with a whole quiche somebody had thrown in there. Everything was slimy. I told him, Bring em home, wash em and then Ill take em. There might be cigarette butts we cant see in the bottom. About a year ago, I found a big old leech clinging to the side of a bottle that a guy had picked up at North Beach. I had to put on a glove to handle it, then gave him back the leech. SD: What about the stench? Theres a strong aroma of stale beer in the room. AP: I dont smell it anymore. Im immune now. When I come home, though, my wife Melissa sometimes tells me that I reek. The funny thing is, I dont even drink. SD: How much cash do you pay out to customers? AP: In one average eight-hour shift, maybe about $800. On a really busy day, $1200 to $1300 total. We figure its about 100 bottles or cans for every $5. SD: How much does the store earn on the deal? AP: The distributors give us 8 cents for soda and beer returns that we pay 5 cents back on, and 18 cents for liquor bottles that we pay 15 cents for. SD: Who is your clientele? AP: Every kind of person you can imagine. We get a lot of street people who take the money, then go out and buy alcohol with it. When the college kids are in town, the street people bring in $60 or $70 worth of stuff at a time. The students just leave them lying around. If everybody in Burlington gave me their bottles, Id be rich in a week. We also get the governor in here. AP: Yeah. He comes in with his Secret Service agents. SD: What are his drinking habits? AP: Polar seltzer water. Maybe some Sprites and colas. Never any beer. But, you know, itd be all right for him to have a beer now and then  hes running the state. Id have beer if I was running the state. SD: Bet he couldnt run a redemption center. AP: Nope. Im the bottle god. Nobody counts bottles like me.